Trustee of the Jobs Research Trust and managing editor of The Jobs Letter, founding trustee of the Taranaki Advocacy Trust, co-founder of the Taranaki Work Trust, former manager the New Plymouth Enterprise Centre. Dave Owens has a long experience with employment programmes and issues. In the in the 80s and 90s, as a manager of the Taranaki Work Trust, he developed and operated enterprise facilitation and business advice schemes and a business incubator in New Plymouth and was active in the national network of employment resource centres. He has been involved with The Jobs Letter from its very early days, first as an associate to the Jobs Research Trust and volunteer proof reader, eventually as a paid writer and later to managing the staff and production. He has also been self-employed as a carpenter. He is the father of two. 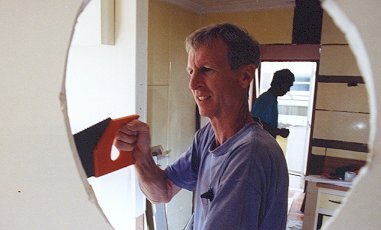 In 2000, Dave Owens went to East Timor (Timor L'oro s'ae) as a volunteer to do what he could to lend his support to the East Timorese who suffered so severely because of Indonesian policies which were implemented under the blind eye of Western governments, including New Zealand's and his birth home the United States. He wrote a series of articles while he was in Timor L'oro s'ae, which are linked, below. He also wrote and narrated a documentary film "Emails from East Timor" which was directed and produced by documentary film maker Peter Marra, based on his experience.